The District/Division Award of Merit is awarded by a District or Exploring Division to volunteer and professional adults for service to youth in the District or Division. Normally, the award is presented for service to youth in excess of five years. 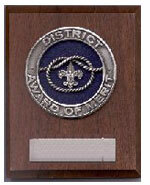 A person may receive more than one District/Division Award of Merit, although there are no provisions for the wearing of a device or emblem officially to denote the second or subsequent awards. Unofficially, those Award holders that have received more than one may wear a small Universal device centered on the knot. The BSA has no records of any volunteer or professional earning the Award of Merit in more than two separate Districts or Divisions. Career members of the Boy Scouts of America may receive this award upon concurrence of the Council Scout Executive and the Director of Operations at the National office, BSA. A nominee must have rendered noteworthy service to youth in Scouting, outside of Scouting, or both. Note: The nature and value of "noteworthy service to youth" may consist of a single plan or decisions that contributed vitally to the lives of large numbers of youth or it may have been given to a small group over an extended period of time. In addition to the Overhand knot patch shown above, recipients receive a plaque, shown below.